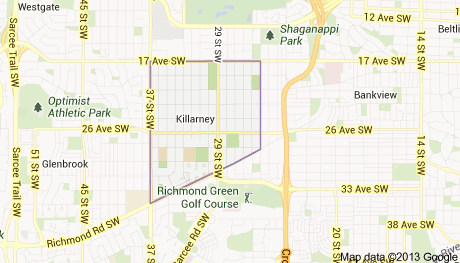 Tucked in just southwest of the downtown Calgary core is the community of Killarney, also known as Killarney/Glengarry. 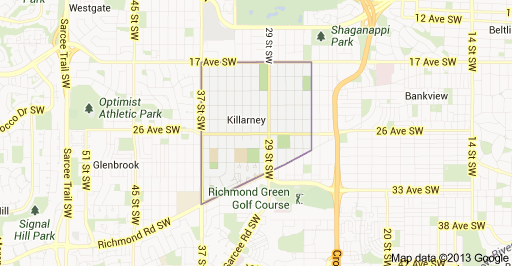 Bounded by 17th street to its’ north, 37th street to its’ west, Richmond Road to its’ south, and 25a street to its’ east, Killarney’s development began in 1906 when its’ original subdivision plan was registered with the Alberta Land Titles Office. In the post-war era, developers of the area erected hundreds of smaller bungalows to compliment the smaller stuccos and clapboard structures that populated Killarney already. 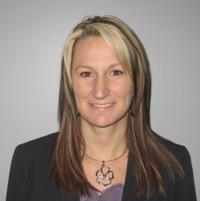 Within the past twelve years, city developers have been slowly replacing the older structures with newer infill housing while Killarney continues with its’ area redevelopment plan. Sir James Lougheed, Killarney elementary, A.E. Cross junior high, Vincent Massey junior high, and Ernest Manning senior high school serve the public school students of Killarney while Catholic school students are assigned to attend the Holy Name elementary school, St. Michael junior high, and Bishop Carroll senior high school. The community’s near 7,000 residents have access to a number of commercial shopping spaces within the 17th avenue and 37th street districts. Westbrook Mall is also located in the neighborhood’s immediate north. There are also parks located in pockets of open space found in Killarney as well as in bordering communities. Many residents enjoy these amenities as well as others that Killarney offers including its’ Aquatic and Recreation Centre, and the restaurants that line its’ northern border. The West LRT C-Train, which only recently opened in December 2012, includes a stop just across 17th avenue. Calgary Transit also provides transportation with stops that surround the community including those on 26th avenue, 37th street, and on 17th avenue. With its’ gentle landscapes and viable routes of transportation relative to other parts of the city, Killarney is a remarkable neighborhood. Its’ community association serves it well and regularly seeks input from the community’s residents on any appeals from the city or others for land development. Those looking for a community that has played a part in Calgary’s history and with an attractive location relative to the downtown core, Killarney is smack dab where it’s at. Far enough from the core to have that small town neighborhood feel while also being in close enough proximity to only be minutes away from downtown, Killarney is gentle, kind, and home.